The crowd watched as detectives and federal agents left Monday’s roundtable. We’d like to say we were shocked at this attempt to spin the public conversation down a rabbit hole into the dark reaches of conspiracy theorists, but this type of behavior has become so commonplace in the sphere of Zeldin’s worldview that at this point there’s nothing shocking about it. We were at Monday’s roundtable, which we too believed was going to be a public forum, and we also spent time talking with the people gathered outside the doors of the public community college library where it was held, where they were barred from entrance by a significant number of police and campus security officers. Inside the library, members of federal and local law enforcement talked at what had been billed as an “immigration roundtable” almost exclusively about their work cracking down on gangs with origins in the Latin American community. 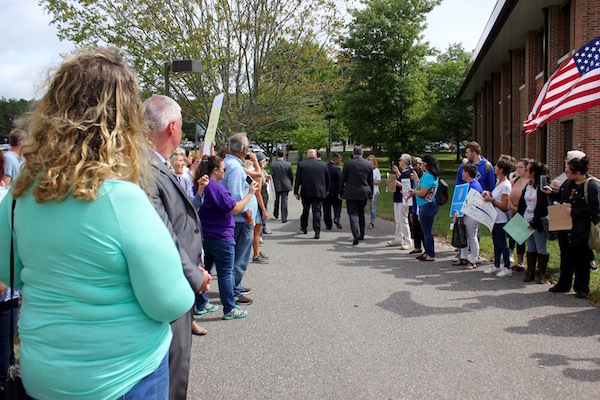 Many of the people gathered outside the building, who had come to the meeting expecting to be a part of the dialogue, were members of established immigrant advocacy groups, and many were students at the college who happened upon what was going on. There were some people whom Zeldin’s office might characterize as “career protesters,” who participate in marches and rallies throughout the East End. Many of them are retirees who care deeply about their country and now have the time and freedom to speak their minds. They aren’t paid. Many there were also volunteer members of town board-appointed anti-bias task forces on the East End who work hard here, without a salary, to protect vulnerable members of the community from hate crimes. The salaries of people who work for immigrant advocacy groups are no less legitimate than the salaries of law enforcement. If Zeldin’s people are attempting to invalidate their livelihood by claiming they are paid protesters, they are entirely missing the point. They are professionals with something clear and useful to add to the dialogue. They are included in the dialogue at many local government meetings here on the East End, not barred from entrance by the police. The true origins of this fracas go straight back to the way the roundtable was rolled out by Mr. Zeldin’s office. There was no reason to title the event an “Immigration Roundtable” when the focus was really on gang violence and law enforcement. If the round-table had been called something like “Combatting Gang Violence on Long Island,” the people outside may have had less reason to be upset. They would have seen the title of the forum as an honest representation of the discussion that took place, even if they disagreed with it. The congressman’s staff could also have saved themselves a lot of grief if they’d informed members of the public ahead of time that they couldn’t attend. They didn’t do that either. We’re left with no other conclusion to draw but that the congressman’s office was aware that the manner in which the roundtable was rolled out would incite civil unrest, and did nothing to keep that civil unrest from occurring. That is troubling. We know that Congressman Zeldin has the capability to include diverse viewpoints in his public appearances — we’ve seen him do so when it comes to many local environmental issues here. We can only conclude from this debacle, and his office’s lack of response to our concerns, that this entire event was orchestrated to rile up the base on both sides of the issue, with Mr. Zeldin calculating that his base would ultimately be more responsive at the ballot box come November. Civil discourse in this country seems long dead. It’s up to all of us to engage our neighbors in productive and truthful dialogue. Our elected leaders, who are paid by all of us, regardless of how we voted, need to put the truth at the top of their concerns. None of us are entitled to our own facts. You perfectly expressed how Lee Zeldin represents only his base by using deceptive tactics to shut out his other constituents. The name change of course is mine. BIG TOUGH LEE! Running away from a few civic minded constituents with the protection of Federal Agents…again! I thought you fought gang violence, and encouraged police brutality, as side kick to Donny Heel Spurs? Guess that’s only when Daddy, I mean Donnys, Secret Service agents are around to protect you? From who? The little old ladies with the cardboard signs who are worried about you yanking their Social Security away. Their called constituents. You work for THEM….Thats about to change! You can go work for the NRA….you already do! LATER LIL LACKEY LEE!